Facial skeletal patterns are just as important to orthodontic treatment as interarch and intraarch dental relationships. Several radiographic techniques are used to determine the facial skeletal pattern of a patient. Cephalometry has been the quintessential tool to determine facial skeletal patterns. Cephalometric analysis is performed in a two-dimensional image with overlapping structures, which assumes that the patient is symmetric. Despite this shortcoming, it has the most well-documented clinical success in facial skeletal pattern determination. A variety of measurements have been applied to cephalometric analysis. In the 1950s, Cecil Steiner developed what is considered to be one of the first cephalometric analysis techniques that are still used to this day. It mainly uses the A point, nasion, B point angle to measure the skeletal jaw discrepancy. Ricketts later modified the technique to introduce the Frankfort horizontal plane (FH) as the reference plane rather than the sella to nasion plane (SN) used in Steiner's analysis. Other techniques developed throughout the years include McNamara's, Down's, Sassouni's, and Witt's analyses. They are all based on a series of bone landmarks that can be associated to represent craniofacial proportions. Measurements are tested in patients with esthetically pleasing faces and ideal dental relations to establish norms. Previous studies on the use OPG for skeletal pattern analysis have focused on symmetry., The Levandoski analysis has introduced landmarks for linear facial skeletal analysis in OPG. In addition, angular measurements for angular analysis of the OPG have been suggested. These studies have used conventional OPG techniques where the patient is biting on a plastic guide, and the mandible is displaced toward an edge-to-edge position. This may allow for the analysis of symmetry but not for analysis of interarch relationships which are of great relevance to orthodontic diagnosis. The aim of this study is to assess vertical and anteroposterior skeletal relationships using OPG. A modified modality of OPG will be used to overcome the deficiencies observed in prior studies. Correlation between traditional cephalometric analysis measurements and novel OPG analysis measurements will be assessed for validation. Symmetry will be examined to justify the need of bilateral facial skeletal analysis. Finally, the new measurements will be applied to a standardized sample of participants with normal facial skeletal relationships to obtain preliminary norms. Twenty-three participants of both genders between the age of 20 and 26 (13 males and 10 females) were selected from the orthodontic clinic at RAK College of Dental Sciences for participation in this study. The study methodology was approved by the RAK Medical and Health Science University-Research Ethics Committee-10-2016-UG-D and respects the Helsinki Declaration of 1975, as revised in 2000. The risks of radiation exposure and the purpose and methodology of the study were explained, and written consent was obtained from each participant. Cephalometric and panoramic radiographs and facial pictures were taken as part of the participant's initial diagnosis materials. All first appointment patients were considered for the study. Participants were excluded if: central incisors and/or permanent first molars were missing, facial asymmetry due to craniofacial syndromes or a history of facial trauma was present, participants suffered severe medical illnesses, participants were undergoing chemotherapy and/or radiotherapy, or were pregnant. Lateral cephalograms were taken under standard conditions using Gendex Orthoralix 9200 DDE Digital Cephalometric + Panoramic X-ray (Model: GEN-XRAY25, Manufacturer: Gendex Panoramic, USA). A new OPG technique was devised. Instead of the participant biting on the bite block, the edges of the maxillary central incisors rested on the bite block during maximum intercuspation. The participant was positioned so that the FH plane was parallel to the floor, and the facial midline was used to align the participant's head sagittally. The head of the patient was stabilized using the radiographic machine's head stabilizer. This technique ensured that the menton (Me) always showed on the radiographs, which may not occur in conventional techniques and that occlusal relationships were present in the OPG [Figure 1]. Since the radiograph was taken in maximum intercuspation, the vertical relationship could be measured. The condylar position was also the same as that in the lateral cephalometric radiograph; thus, the correlation tests could be done more accurately. After that, facial profile pictures from the right side were taken for every patient. All radiographs and photos were taken by the same operator to ensure standardization. All the collected materials were analyzed using Autodesk AutoCAD 2016. Steiner's and Ricketts analysis were used for the analysis of the cephalograms to test the correlation with their corresponding OPG angles and to identify the participants with normal facial proportions. The landmarks used and angles measured as shown in [Figure 2]. 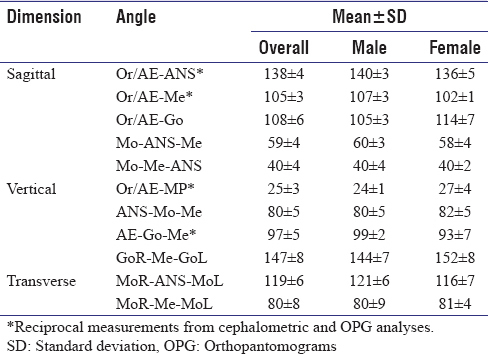 The cephalometric values used as norms to identify the sagittal and vertical skeletal patterns are shown in [Table 1]. Facial photographs were used to measure the facial convexity angle. Normal patients were those who presented 165–175° angles. The participants who were within the normal standards of cephalometric analysis and facial convexity were included in the subgroup that was later used to establish preliminary standards for OPG analysis. OPG analysis was done using bone landmarks [Figure 3] and an experimental set of angles that would measure symmetry and sagittal and vertical relationships [Figure 4]. The main reference line used was a line from orbitale to the AE (Or/AE), which represents the cranial base. The sagittal position of the maxilla was measured as the angle formed from Or/AE to the anterior nasal spine (Or/AE-ANS). The sagittal position of the mandible was measured as the angle formed from Or/AE to Me and the angle formed from Or/AE to Go. The sagittal position of the dentition in the maxilla and the mandible were measured as angles from molar to ANS to Me and Mo to Me to ANS, respectively. Facial height was measured between Or/AE and the mandibular plane. The height of the lower facial third was measured as an angle from the ANS to Mo to Me. The gonial angle was measured as an angle from the AE to Go to Me. The steepness of the mandible was measured as an angle from the gonial angles on each side of the mandible and Me (GoR-Me-GoL). 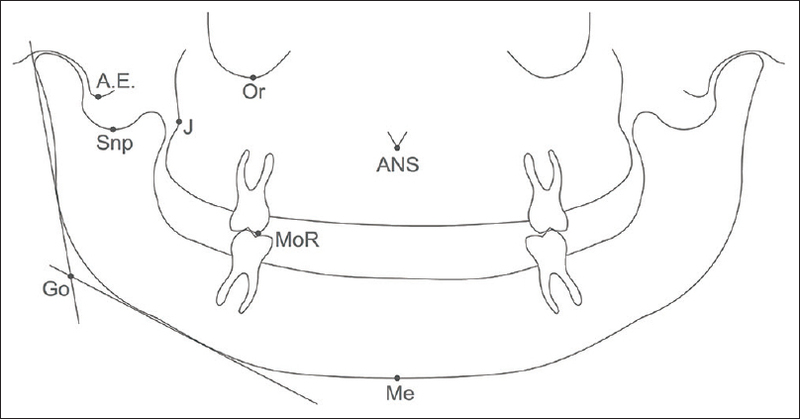 The transverse dimensions of the maxillary and mandibular arches were measured as the angles between Mo on each side of the arch and the ANS (MoR-ANS-MoL) and Me (MoR-Me-MoL), respectively. Symmetry was assessed between the right and left articular eminence (AE), J point (J), sigmoid notch point (Snp), and gonion (Go). The angles formed by the line joining the right and left landmark and the facial midline were measured [Figure 4]. The points were considered symmetric when 90° angles were formed to the right and left of the midline. The degree of asymmetry was calculated as the difference between the two angles. Pearson's correlation was used to assess the relation between the cephalometric angles and the corresponding OPG angles of all the participants in the sample. P < 0.05 were considered statistically significant. The subgroup of normal patients underwent complete OPG analysis using the newly devised technique. Measurements were made from both sides of the face where applicable and used as independent values for one parameter. The means and standard deviations for the OPG measurements of this subgroup were calculated to establish norms. Average symmetry measurements of 0.49–4.09, 0.33–3.09, 0.91–4.81, and 0.15–4.42 were observed for AE, J, Snp and Go, respectively [Table 2]. Only 1 (4.5%) participant presented absolute symmetry on all measurements included in this study. 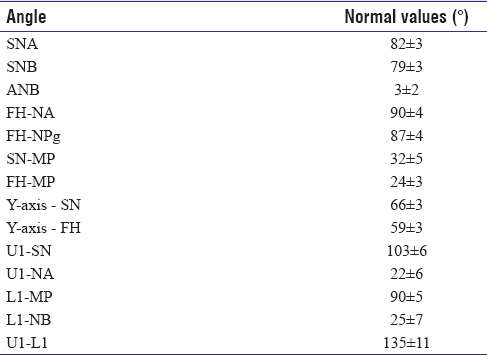 The subgroup of normal patients also presented a similar degree of asymmetry [Table 2]. Significant differences between the symmetry of AE, J, Snp and Go were not observed. 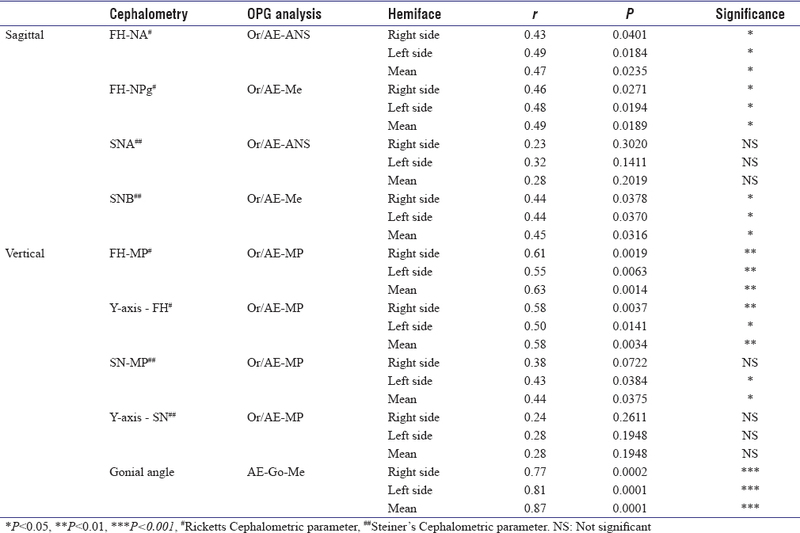 Significant correlations were observed between the sagittal measurements for the maxilla and mandible on the OPG analysis and Ricketts cephalometric analysis [Table 3]. 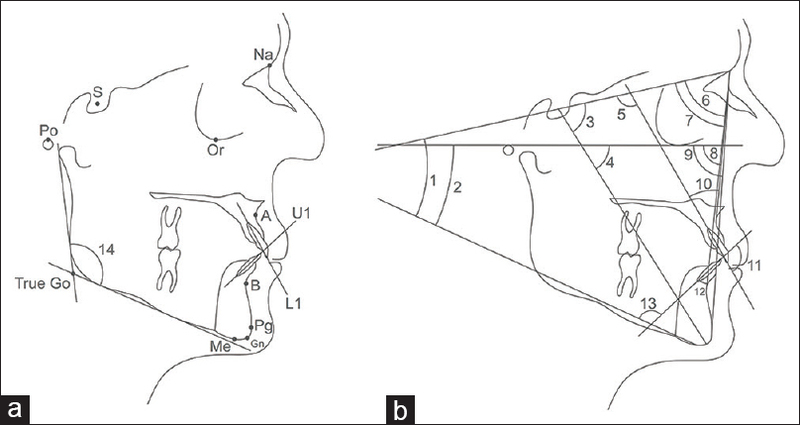 A significant correlation was observed between the sagittal measurement of the mandible but not the maxilla when comparing the OPG analysis and Steiner's cephalometric analysis. The OPG analysis angles used to measure the vertical facial proportion were significantly correlated with the angles corresponding to Ricketts analysis but not to those corresponding to Steiner's analysis. The highest level of significance was found between the gonial angle measured in the OPG and cephalometric analyses. A total of 8 (35%) participants in the sample were found to be within normal values of sagittal and vertical proportions after assessing the cephalometric analysis parameters in cephalograms and the convexity angles in facial profile pictures. The normal values for the OPG analysis measurements are shown in [Table 4]. Five sagittal measurements are suggested to determine the anteroposterior position of the maxilla and mandible. Four measurements are suggested for the assessment of facial height; and two measurements are suggested for measurement of transverse relationships of the arches. From these 14 angles, four can be directly compared with existing cephalometric analysis parameters [Table 4] and [Figure 5]. Statistically reliable standard deviations were found for all the measurements. Differences are observed for the standards of the total sample of normal patients and for subgroups of males and females. The normal values for the OPG analysis should be gender dependent. Significant correlations were found between the measurements from traditional cephalometric analyses and a novel OPG analysis technique. It was also found that symmetry is not frequent even in individuals where normal sagittal proportions are determined based on cephalometric and facial analysis. A preliminary set of panoramic radiographic norms for facial analysis have been established using the novel OPG analysis technique. The most relevant disadvantage of cephalometric analysis for facial skeletal analysis and orthodontic diagnosis is the overlapping of bilateral structures and the assumption that the studied participants are symmetrical. In cases where bone landmarks are duplicated in the cephalogram, measurements are usually averaged to compensate for the underlying asymmetry of the face. However, averaging does not provide reliable values. This study shows that symmetry should not be expected in any patient and that analysis of both facial hemispheres is recommended. This could increase operational time but improve accuracy of diagnosis and treatment planning. The clinical application of radiographic analyses of facial skeletal patterns requires a set of measurement values that are considered to be present in a normal population. Studies summarizing the measurements values observed on participants with ideal facial proportions have been used for this purpose for decades.,, They require standardized age, gender, and ethnicity to determine the norms applicable to a specific population., The normal sample in this study was chosen based on the already existing normal cephalometric measurements and facial convexity angle. 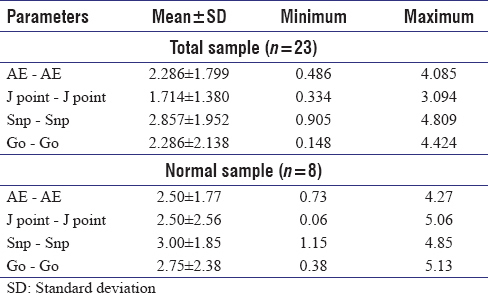 A preliminary set of normal measurement values has been obtained from the normal patients in the studied sample. Even though the preliminary mean and SD values are promising, the number of normal participants within this study sample was limited and not sufficient to establish norms to be used in a clinical setup. Therefore, future research must include larger, standardized samples to formulate a more conclusive set of norms. The results of this study provide reliable information on the use of OPG for sagittal, vertical, and transverse analysis of the facial skeletal patterns. This technique can be used as a complement to cephalometric analysis without the additional exposure to radiation required for CBCT or can be used as an alternative in clinical setups where panoramic radiographs are the only available tools for facial skeletal diagnosis. Facial skeletal symmetry is rarely observed and can affect the reliability of cephalometric analysis. Bilateral facial skeletal assessment and asymmetry analysis can be done in a panoramic radiograph to the benefit of orthodontic diagnosis and treatment planning. The novel OPG analysis technique presented in this study is comparable to traditional cephalometric analysis techniques and has the potential to assess sagittal, vertical, and transverse facial skeletal relationships in an OPG. The authors would like to acknowledge Dr. Hala Zakaria, associate professor at RAK College of Dental Sciences, for providing additional help with all radiographic equipment used in the study. This project was fully funded by RAK College of Dental Sciences. Naragond D. Diagnostic limitations of cephalometrics in orthodontics – A review. IOSR J Dent Med Sci 2012;3:30-5. Proffit W, Fields H, Sarver D. Contemporary Orthodontics. 5th ed. St. Louis, Mo. : Elsevier/Mosby; 2013. p. 190-2. Ricketts RM, Bench RW, Hilgers JJ, Schulhof R. An overview of computerized cephalometrics. Am J Orthod 1972;61:1-28. Duterloo HS. A reflection on radiographic cephalometry: The evaluation of sagittal discrepancy. J Orthod 2014;41:208-17. Karatas OH, Toy E. Three-dimensional imaging techniques: A literature review. Eur J Dent 2014;8:132-40. Signorelli L, Patcas R, Peltomäki T, Schätzle M. Radiation dose of cone-beam computed tomography compared to conventional radiographs in orthodontics. J Orofac Orthop 2016;77:9-15. Silva MA, Wolf U, Heinicke F, Bumann A, Visser H, Hirsch E, et al. Cone-beam computed tomography for routine orthodontic treatment planning: A radiation dose evaluation. Am J Orthod Dentofacial Orthop 2008;133:640.e1-5. Ongole R, Praveen BN. Clinical Manual for Oral Medicine and Radiology. 1st ed. New Delhi, India: Jaypee Brothers Medical (P) Ltd.; 2007. p. 274, 338-40. White SC, Pharoah MJ. Oral Radiology: Principles and Interpretation. 6th ed. Missouri, USA: Mosby/Elsevier; 2009. p. 35, 175, 236-8. Whaites E, Drage N. Essentials of Dental Radiography and Radiology. 5th ed. Edinburgh: Churchill Livingstone, Elsevier; 2013. p. 61, 176, 184. Frommer H, Stabulas-Savage J. Radiology for the Dental Professional. 9th ed. St. Louis, Mo. : Mosby, Elsevier; 2011. p. 240, 246-50. Kubota Y, Takenoshita Y, Takamori K, Kanamoto M, Shirasuna K. Levandoski panographic analysis in the diagnosis of hyperplasia of the coronoid process. Br J Oral Maxillofac Surg 1999;37:409-11. Piedra I. The Levandoski panoramic analysis in the diagnosis of facial and dental asymmetries. J Clin Pediatr Dent 1995;20:15-21. Akcam MO, Altiok T, Ozdiler E. Panoramic radiographs: A tool for investigating skeletal pattern. Am J Orthod Dentofacial Orthop 2003;123:175-81. Biagi R, Craparo A, Trovato F, Butti AC, Salvato A. 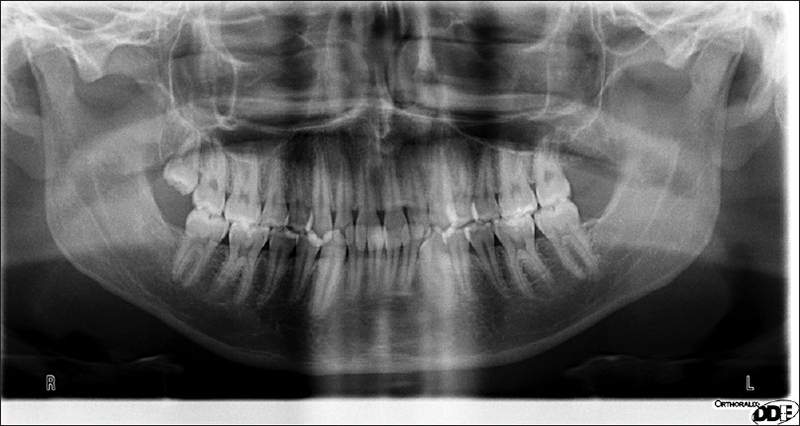 Diagnosis of dental and mandibular asymmetries in children according to Levandoski panoramic analysis. Eur J Paediatr Dent 2012;13:297-300. Silvestrini-Biavati F, Ugolini A, Laffi N, Canevello C, Silvestrini-Biavati A. Early diagnostic evaluation of mandibular symmetry using orthopantomogram. Indian J Dent Res 2014;25:154-9. Catić A, Celebić A, Valentić-Peruzović M, Catović A, Jerolimov V, Muretić I, et al. Evaluation of the precision of dimensional measurements of the mandible on panoramic radiographs. Oral Surg Oral Med Oral Pathol Oral Radiol Endod 1998;86:242-8. Samawi SS, Burke PH. Angular distortion in the orthopantomogram. Br J Orthod 1984;11:100-7. Vazquez L, Nizam Al Din Y, Christoph Belser U, Combescure C, Bernard JP. Reliability of the vertical magnification factor on panoramic radiographs: Clinical implications for posterior mandibular implants. Clin Oral Implants Res 2011;22:1420-5. Bhullar MK, Uppal AS, Kochhar GK, Chachra S, Kochhar AS. Comparison of gonial angle determination from cephalograms and orthopantomogram. Indian J Dent 2014;5:123-6. Okşayan R, Aktan AM, Sökücü O, Haştar E, Ciftci ME. Does the panoramic radiography have the power to identify the gonial angle in orthodontics? Scientific World Journal 2012;2012:219708. Gateño J, Xia JJ, Teichgraeber JF. Effect of facial asymmetry on two-dimensional and three-dimensional cepgalometric measurements. J Oral Maxillofac Surg 2011;69:655-62. Lin WL. A cephalometric appraisal of Chinese adults having normal occlusion and excellent facial types. J Osaka Dent Univ 1985;19:1-32. McNamara JA Jr., Ellis E 3rd. Cephalometric analysis of untreated adults with ideal facial and occlusal relationships. Int J Adult Orthodon Orthognath Surg 1988;3:221-31. Fang F, Clapham PJ, Chung KC. A systematic review of inter-ethnic variability in facial dimensions. Plast Reconstr Surg 2011;127:874-81. Wu J, Hägg U, Rabie AB. Chinese norms of McNamara's cephalometric analysis. Angle Orthod 2007;77:12-20.